The glorious island of Sardinia offers much for visitors to enjoy, but few attractions are as breath-taking and memorable as the magnificent and mysterious Neptune’s Grotto. 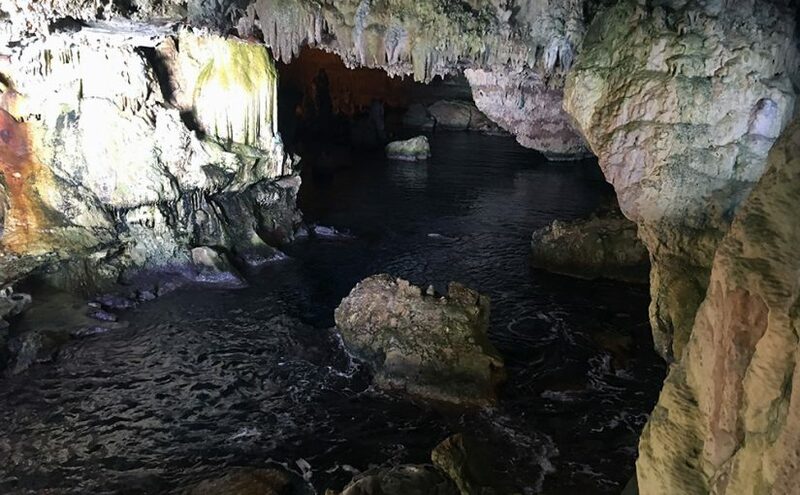 Named after Neptune, the mighty God of the Sea, this astonishing system of caves was discovered by accident in the 18th century, and today is regarded as one of the ‘must-see’ attractions on the island. 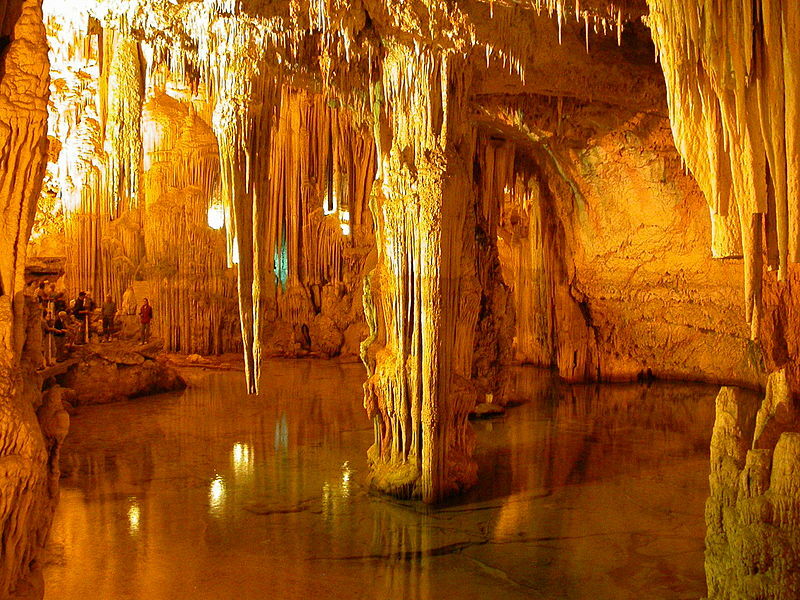 Near to the wonderful and historic town of Alghero, the grotto is an extensive collection of caves – of which a few have been made accessible to tourists – featuring some of the most spectacular stalactite and stalagmite formations anywhere in world, providing a beautiful and unforgettable example of how exquisite nature can be. The extent of the cave system that the public can visit consists of four different rooms, each with its own wonderful sights to enjoy. After entering the caves – via a passage of amazing stalagmite formations – you can also take in the incredible kilometre-long beach, and the quite beautiful Lamarmora underground salt lake. From the Reggia Room, which is famous for its colossal column and vault roof that together form a pair of magnificent arches, you can follow a line of smaller columns to the lake and the beach itself. You can view the beach and lake from the Music Podium which sits above the room, and from there you can take a passage to the Room of the Ruins and the Smith Room, the latter names after the sea captain who discovered it. Here, you will see a stunning formation with flowing features that resemble a church organ, hence it alternatively being known as the Organ Room. The fourth room, the Room of Laces, is equally magnificent and features some quite unique rock, stalagmite and stalactite formations. Although Neptune cave system is thought to extend to more than 4km, only a small proportion is safe for the public, and all tourists are accompanied by experienced guides who give commentary in both Italian and English. The 110metre high Capo Caccia cliffs, in which Neptune’s Grotto is located, are home to a series of cave systems, some of the others of which are also open to the public. Yet it is Neptune’s Caves that offer the greatest experience among them all. It is important to understand that the entrance to the caves is practically at sea level. This means the grotto can only be accessed when the waters are calm and low enough. 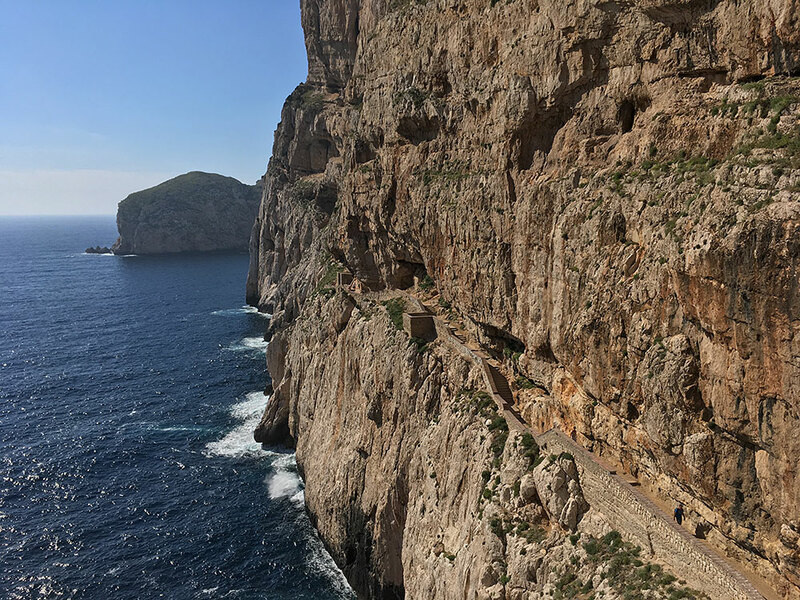 There are two ways to visit the grotto: you can take the car from Alghero, which many people who have hired a car to tour Sardinia choose to do. 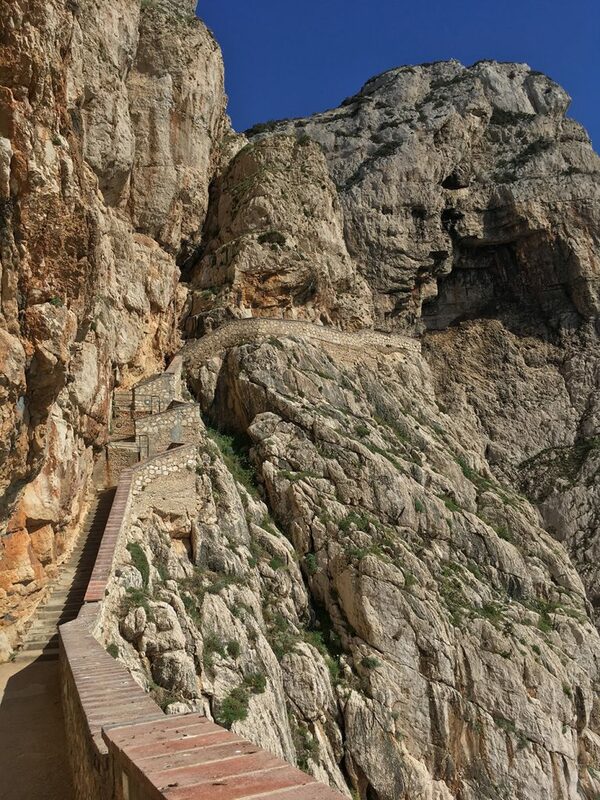 If you do choose to visit by car you need to be aware that once parked in the car park at the top of the cliffs, you must tackle an arduous set of steps – the Escala del Cabirol – that wind down the cliff face, and that were cut in the 1950’s to give access as the grotto was previously only accessible by water. This staircase consists of more than 650 steps, and is not recommended for families with small children or anyone who is not fully fit. If you are able to handle the climb down and up, the steps do provide spectacular views of the sea and the rock face, so may well be worth your effort. To reach the caves by road from Alghero, take the SS127 out of the town heading towards Fertilia. Stay on this road until you reach a roundabout near Maristella, where you should take the exit onto the SP55. This will take you all the way to the grotto, which is signposted clearly, and the journey – of around 25km – should take around half an hour, traffic permitting. Neptune’s grotto opening hours: from Monday to Friday 8:00am / 8:00 pm. The easiest way to visit Neptune’s Grotto is to take one of the many boat trips that leave from the Port of Alghero on a regular basis. Not only do you avoid the steps down the cliffs, but the journey is thoroughly enjoyable and affords you excellent views of the cliffs as you approach. 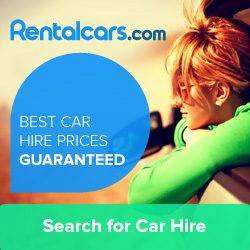 This is by far the best method of visiting for anyone with children or older persons. 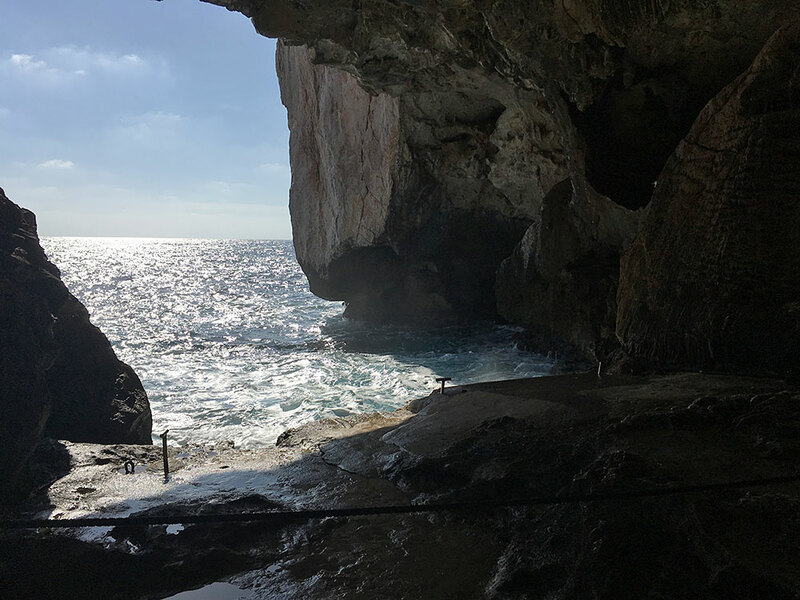 There is something quite magical about Neptune’s Grotto, and about the entire region around the coast here, and it really is somewhere you should have at the top of your list to see when you are visiting Alghero or Sardinia. The boat trip and the caves themselves both require payment, but it is not expensive, and be aware that boat trips to the caves run less frequently during spring and autumn than in the peak summer months. It can also get very busy – with a lot of people in a confined space – but once again, Neptune’s Grotto is one quite unique and utterly amazing sight that you don’t want to miss.